We specialize in unique flavored marshmallows, artisan chocolates, old fashion candies and caramels all made in our Southern Oregon kitchen with lots of care. All of our products are kosher candy that are handmade in small batches and hand-cut to size or formed into shapes by our crafty confectioners. We pride ourselves in the delicious flavors, wonderful presentation and quality we create with our all natural, gourmet products. Nutrition Facts per serving 1 " x 1 ' x 1" mallow Amount per serving Calories 64 Calories from fat 0 % Daily Value * Total Fat 0g 0% Saturated Fat 0g 0% Cholesterol 0mg 0% Sodium 9mg 0% Total Carbohydrate 15.6g 5% Dietary Fiber 0g 0% Protein 0.5g. Additional Information 0% of calories from Fat 96.9% from Carbohydrates 3.1% from Protein. Sugar, corn syrup, water, vanilla, gelatin, corn starch may or may not contain; strawberry extract, lemon oil, espresso, natural vanilla, cocoa and food colorants. Additional Information 0% of calories from Fat, 96.9% from Carbohydrates, 3.1% from Protein. Additional Information: 50.2% of calories from Fat, 46.7% from Carbohydrates, 3.1% from Protein. *Percent Daily Values based on a 2,000 calorie diet. Your daily values may differ. Sugar, water, corn syrup, powdered egg whites, coconut oil, walnuts, inverted sugar, salt, natural vanilla and natural flavors. Cocoa, Unsweetened Chocolate, Cane sugar, cocoa butter, soy lecithin (added as an emulsifier), spices & natural vanilla. Milk, cane sugar, brown cane sugar, corn syrup, butter, unsweetened chocolate, Sugar, cocoa butter, soy lecithin (added as an emulsifier), natural vanilla. Unsweetened chocolate, cane sugar, dry roasted almonds, cocoa butter, coconut oil, soy lecithin (added as an emulsifier), natural vanilla, water, kosher gelatin, salt and espresso. *All Kosher symbols on this page are copyrighted materials, belonging to the copyright owners. 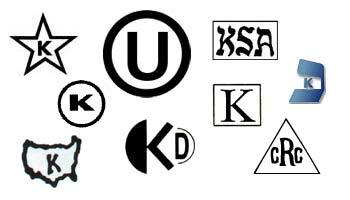 These symbols do not indicate that we are certified kosher by these groups, only that we take pride in using their certified products at our facility. Please follow the links to these kosher certification groups if you need further information on the ingredients we use.